Lexar Media today announced that it has doubled the speed rating of its popular Professional 8GB CompactFlash memory card to 90X. Furthering the company's lengthy heritage in delivering cards with market-leading performance, the new 8GB card is one of the fastest high-capacity CompactFlash cards available. On display at the Photo Marketing Association International (PMA) show, Lexar's new card is capable of a minimum sustained data write speed of 13.5 MB per second. In addition to increased speed and performance, the new high-speed card will be available in CompactFlash Type I flash memory card format, the most popular format for today's SLR digital cameras. Lexar CF memory card - High-speed - "The performance of our new memory card allows for a high-speed transfer of large files at all points in the digital photography process including during image capture and throughout the downloading process to the photographer's computer, directly addressing the needs of today's photographers," said John Omvik, director of professional product marketing, Lexar. "CompactFlash Type I remains the most popular card format for photographers using high-end digital cameras including those units within the rapidly growing digital SLR category." Lexar 90x CompaxtFlash memory card - "The size of the card is only one of the key elements in the digital photography process," said David Honl, professional photographer, who is currently featured on Lexar's digital photography website. "The speed at which I can move the content from my card to my computer is also extremely important, particularly when I've spent the day filling multiple cards while shooting in RAW format with my Canon EOS 1D Mark II. The speed of the card directly contributes to an improved digital photography workflow," he added. Lexar 8GB CompaxtFlash card - Lexar Image Rescue 2.0 - Like all Lexar professional flash memory cards, the new 8GB CompactFlash includes the full version of Lexar Image Rescue 2.0, the company's award-winning image recovery software, and Paint Shop Pro 9, the image editing and management software program from Corel, and a trial version of Photo Mechanic, the popular image browsing software application by Camera Bits. 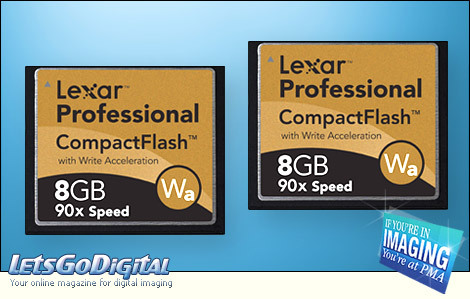 Lexar's new Professional 8GB CompactFlash Type I card will be available in April. Lexar will display its new 8GB CompactFlash card along with its full line of professional photography products at PMA.